Retina iPad Mini experiencing early burn-in issues? The Retina iPad Mini was held back from release alongside the iPad Air earlier this month for undisclosed reasons, with the release set for “Late November”. Some theories stemmed to suggest that there was some burn-in issues with the panels used on the Retina iPad Mini, especially those manufactured by Sharp. It seems early adopters of the new iPad Mini are finding this is still the case. You’ll recall there were issues similar to what is reported with the Retina iPad Mini with the 15-inch Retina MacBook Pro where the display would retain an image after removing it from the screen, called burn-in. 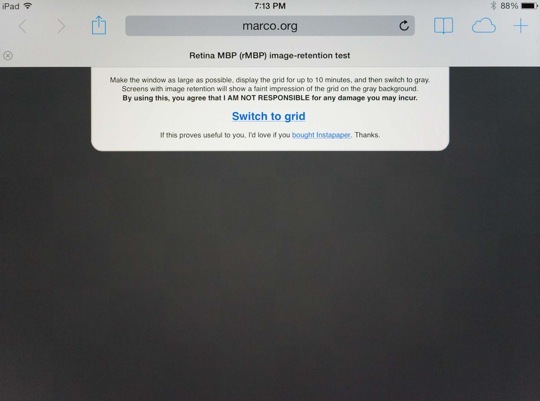 It seems that if you open a checkerboard pattern page and leave it open for around 10 minutes and then switch back to a grey background, you’ll still see that check board burnt-in to the display, meaning your Retina iPad Mini is suffering from what Marco describes above, and what seemingly was delaying the release of the Retina iPad Mini all along. Although the issue is not likely to cause a problem during normal daily operation, it is still something you’ll probably notice and will warrant a replacement device. However, you might want to wait until the initial batch has been exhausted to prevent it from happening again.